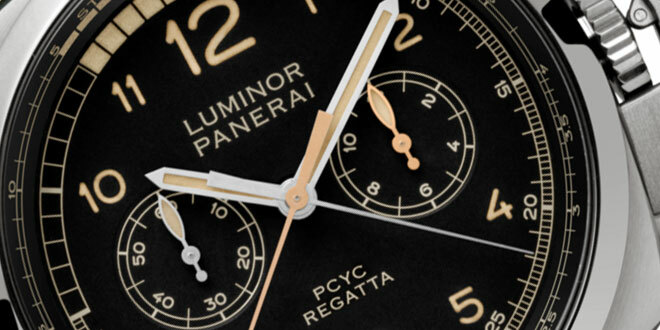 Officine Panerai has just released another mid year model piece to it’s lineup. 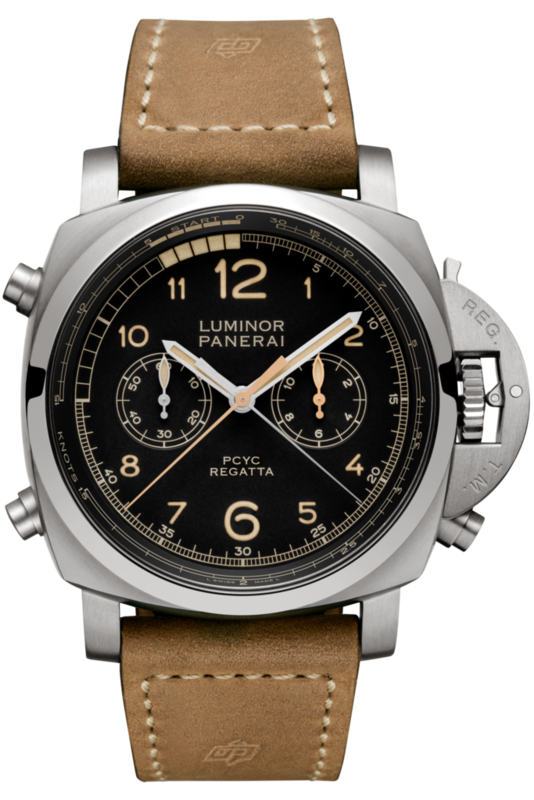 The new Panerai PAM652 47mm Luminor Marina Titanio (Titanium) Chronograph Flyback is part of a new series of watches created specifically for the PCYC (Panerai Classic Yacht Challenge). The PAM652 which fuses classic and contemporary aspects is powered by the P.9100/R movement, which is designed and created entirely at their Manufacture in Neuchâtel. The movement gives watch enthusiasts with a watch that is able to measure the countdown marking the start of the race. The watch features a black dial featuring a large 12 & 6 and smaller arabic numerals around the outer edges. The dial two sub dials and displays all the elements of the chronograph which are easily recognizable. The hour and minute hand are silver in color fill with a faux vintage lume giving it a nice contrast. The two hands of the chronograph are done in different colors to make them very easy to read. The central seconds hand is rhodium while the minute hand is gilded. The right sub dial counts the hours while the left sub dial measures the seconds of the time. The flange around the edge of the dial is marked with a tachymeter scale in knots which helps you measure the average speed of a yacht over one nautical mile. The chronograph movement features a 3 button system to start/stop, flyback, and reset the chronograph. The watch is finished off with a beautiful natural untreated leather strap, titanium buckle, and the OP logo heat stamped on the lug end it. The 47mm Titanium case is finished in a brushed finished while the bezel is created in a contrasting polished finish. 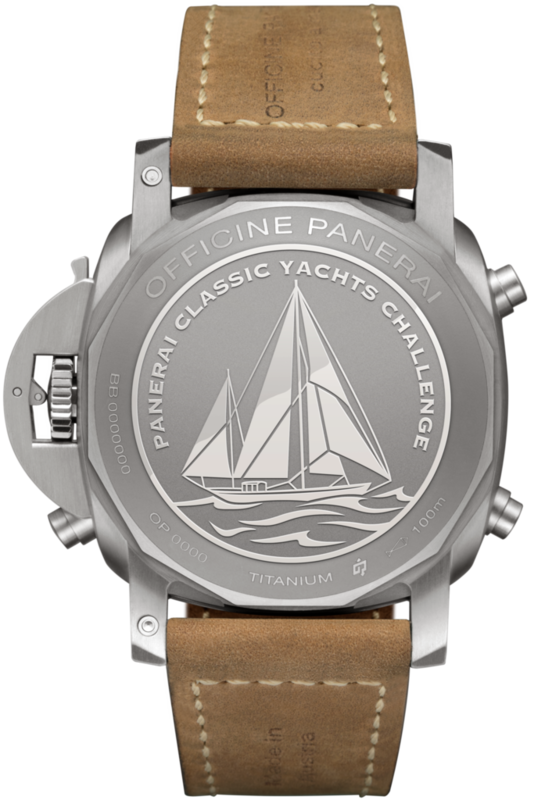 Turning the watch on the back you notice a titanium case back that has the “Panerai Classic Yachts Challenge” and a classic yacht etched into it. Details in regards to pricing and availability have not completely been released but as soon as they are I will for sure share them with you. Movement – Automatic mechanical, Panerai P.9100/R calibre, executed entirely by Panerai, 13¾ lignes, 9.55 mm thick, 37 jewels, Glucydur® balance, 28,800 alternations/hour. Incabloc® anti-shock device. Power reserve 3 days, two barrels. 328 components. Dial – Black with luminous Arabic numerals and hour markers. Chronograph hour counter at 3 o’clock, small seconds at 9 o’clock, central chronograph seconds and minutes hands.